It’s been a stressful couple of weeks. 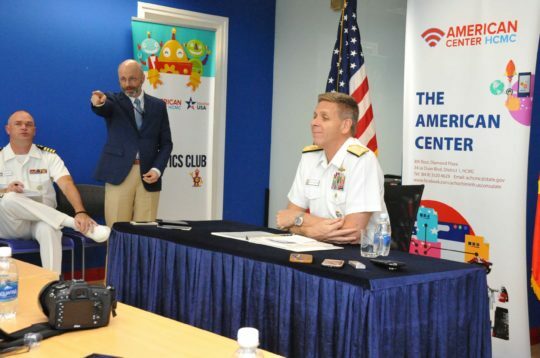 We hosted the commander of the Indo-Pacific Command, who visited Hanoi and Ho Chi Minh City. My team organized a press conference for the Admiral. I’ve been working with many of the journalists for nearly a year now. I encourage them to be more assertive and ask follow-up questions. To my delight, many of them did so. The next day we hosted a CODEL (Congressional Delegation). 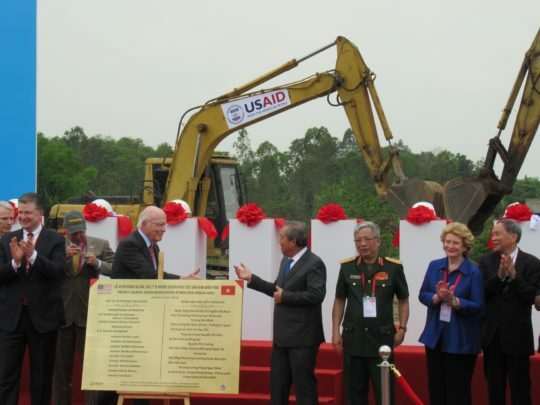 Nine senior senators came to Vietnam for several days. They were mainly discussion “war legacy” issues like dioxin (“agent orange”) remediation. Again I was the press officer. There was a big ceremony to mark a cleanup project at a nearby air base. For security reasons, everyone at the airbase had to have a badge. The Defense Ministry didn’t know what to do with me, so I was a “reporter” for the day. 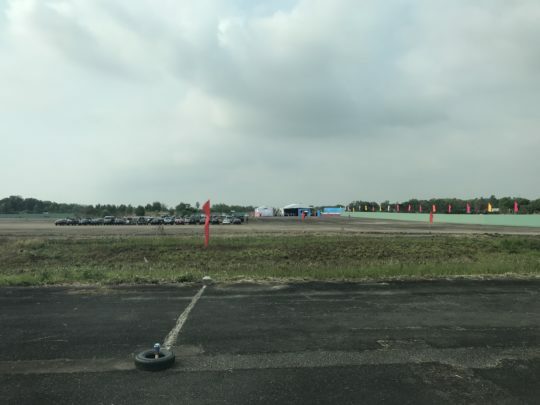 April is the hottest month in Vietnam, and the airbase is a huge area of concrete runways. Tents could shield the CODEL from the sun, but we couldn’t keep them out of the heat. 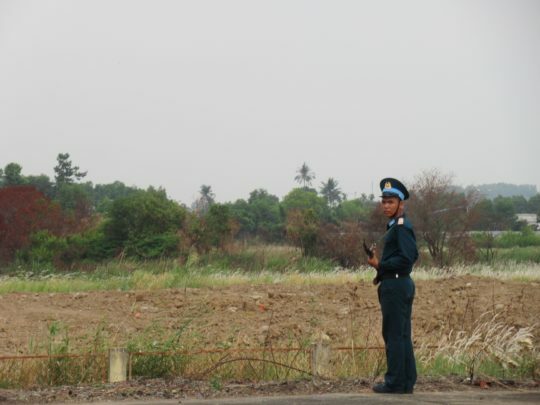 The Bien Hoa airbase is the biggest remaining “hotspot” of dioxin contamination. It’s going to take a lot of money and a lot of time for us to clean up our mess. But I’m proud that our country is fulfilling our moral responsibility. 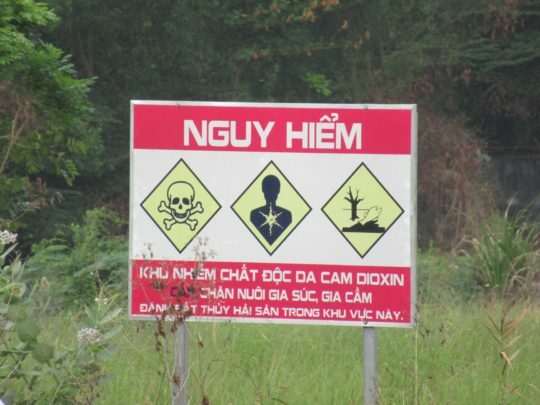 You don’t need to read Vietnamese to know that this sign is a warning that the entire area is contaminated. If this were in the U.S., we would be wearing hazmat suits. This isn’t my first trip to the airbase, but I hope it’s my last. I later heard that just being there is dangerous exposure to Agent Orange. You’d look angry, too, if your job was guarding a field of poisonous dirt. A symbolic ribbon-cutting ceremony. That’s Michigan Senator Debbie Stabenow second from the right! When we were planning the events, I pushed for as much press access as possible. The local reporters really stepped during the interviews. The lead question was about the next generation of U.S. advocates for Vietnam war legacies. After the death of John McCain, we don’t have any more Vietnam vets in Congress. 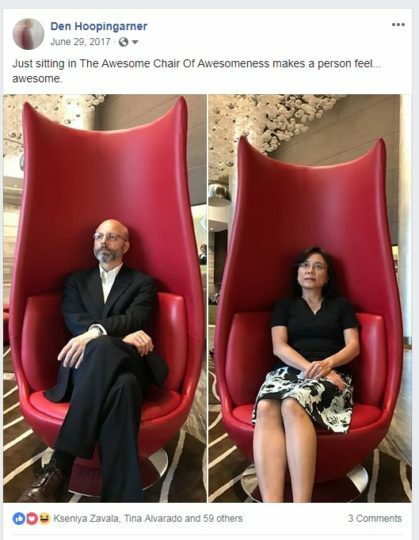 However, there is a Vietnamese-American congreswoman. Could that be the new direction in U.S.-Vietnam relations? From war legacies to people-to-people? The Ambassador and Senator Leahy were great on camera, and had a good rapport with the reporters. During the interviews, I had a nice chat with Mrs. Leahy, she is sharp-minded, strong, and pleasant. How funny is it that I felt proud of the reporters for asking good questions? I guess I’ll always have the teacher mentality. There was a short unstructured time period when reporters could do pull-aside interviews. I advised reporters about which Senators are on which committees, and told them to go hunting. Many of them got good one-on-one interviews, and they were thrilled. 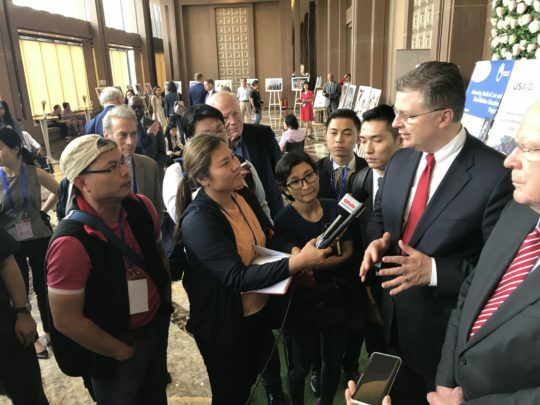 Vietnamese politicians don’t like to talk to reporters, whereas American politicians love it. So the reporters had a nice cultural experience as well as getting good stories. I orchestrated a pull-aside interview with Debbie Stabenow for a local reporter. 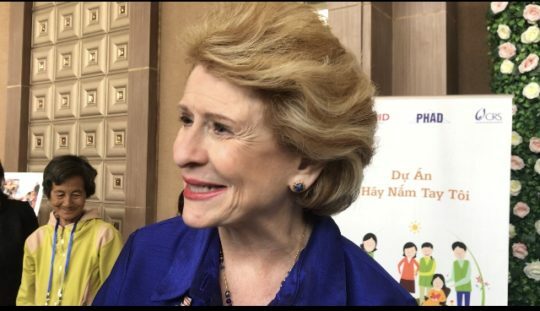 Stabenow is on the Agriculture Committee in the Senate, so she is influential in policies that directly affect Vietnam. But mainly because, you know, Debbie Stabenow. She made a great impression on several female reporters. We were out in the heat all morning, and my the time I got home, I was beat. I wanted to take a shower and go to bed. But that wasn’t the end of my day. I decontaminated my clothes as best as I could, then I had to go on a field trip. But this field trip was not just work, it was a pleasure, too. I’m on the program and entertainment committee for this year’s July 4 event. The theme is “Jazz in the Park.” My job is to find suitable jazz entertainment. 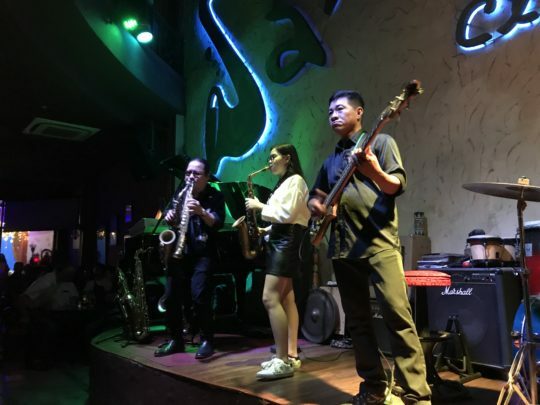 Lucky for us, we have a connection with the best jazz musician in Vietnam. I went to his club to meet with him, and ask him to perform for us. Yes, he’s playing two saxophones at the same time, and yes, that’s his daughter playing next to him. They put on a great show. As luck would have it, I recently helped his daughter with some student visa advice, so we already had a good relationship. We came up with a great idea to have an interactive jazz performance. I was so excited that I got goosebumps. It’s going to be a really great event. This job is never the same two days in a row. It’s usually exhausting, sometimes exasperating, occasionally baffling, but never, ever, boring. I can’t believe that I have to leave this country in only a few months. 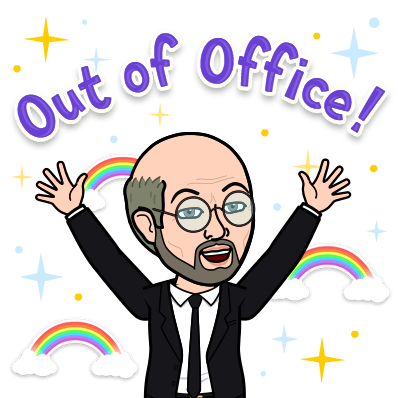 Just when I’m starting to feel like I’m not completely incompetent, that I understand more about the culture and society, I have to prepare to pack up and say good-bye. That’s the name every Season One finale episode of every Aaron Sorkin television show. I really had to think about that question for a minute. At that point, I was on my third glass of wine. Wine is very expensive in Vietnam, import duties raise the price. So when I get to enjoy a glass of wine that I don’t have to pay for, I take advantage of the chance. In addition, my day had been stressful enough that I really enjoyed taking advantage of the open bottle of wine. When I was eating breakfast this morning, I was about to leave and go to work. 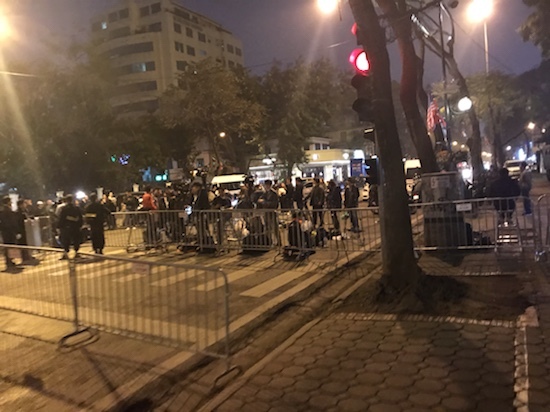 A hotel employee told me that if I didn’t leave right now, I would have to wait another 30 minutes, because of a “security event.” They were going to lock down the restaurant, and prevent anybody from walking into the hotel lobby. The leader of North Korea, Kim Jong-un, happens to be staying in the same hotel as I am. I have been reminded of that fact every time I enter the hotel, when I have to pass through security. 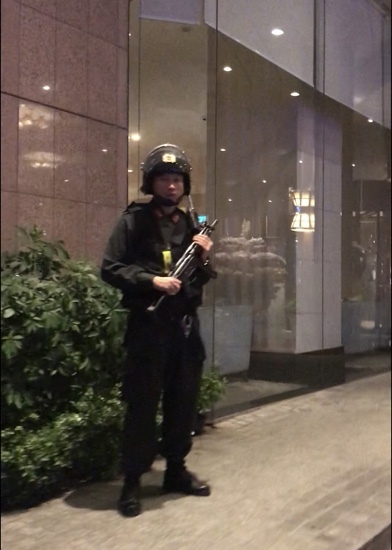 I get a second reminder of that when I return to the hotel every evening, and passed by the armed guards. 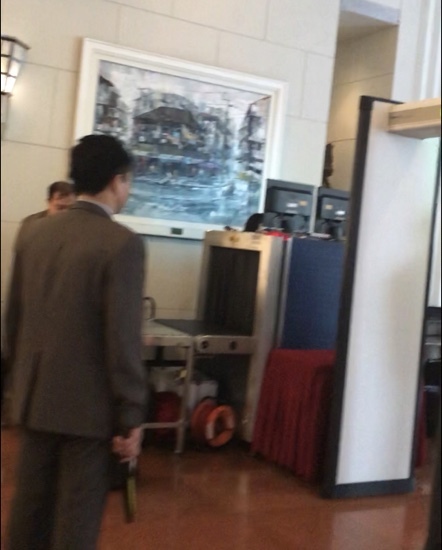 I was hoping to surreptitiously film Mr. Kim as he walked through the lobby, so I decided to wait in the restaurant. I even got a nice point of view from the hotel’s restaurant’s entrance. I very stealthily put my cell phone in my suit jacket front pocket, facing out, sort of stealth cam like. I thought I was being pretty clever, but apparently not clever enough for the North Korean security services. I was apparently not stealthy enough. The security guys were on to me, and so they posted a person to stand right in my line of sight, effectively blocking my view. So I got a view of exactly nothing. Oh well. So after of the drama of waiting around and looking at nothing, I was finally able to leave the hotel, go to the embassy, and start working. 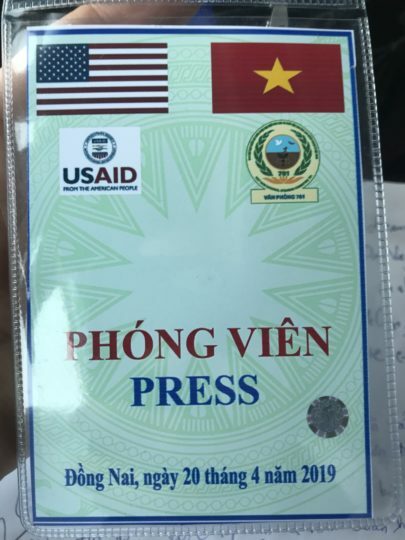 During this “VVIP visit,” my job has been to monitor the media coverage of the summit, and compile a daily press summary. As you can imagine, the press coverage has been pretty chaotic. I finished my report early this evening, and I emailed it out to people who had already taken off in Air Force One three hours before, meaning that they would not be able to even receive my email until they land in Washington DC in about 12 hours’ time. Nevertheless, it was necessary that I get this report out as soon as possible. To people who will not be able to read that email for 12 hours. If you’re confused by that requirement, welcome to my world. 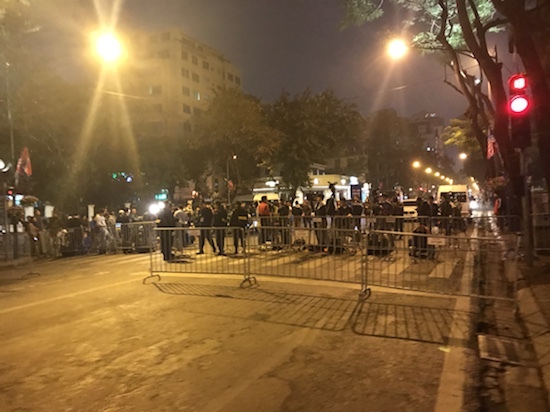 I was not able to go directly to the hotel after work, because the hotel is still fenced off due to the very special guest who is still checked into the hotel, apparently. All I could say to the taxi driver was: “get as close as you can get.” I walked the rest of the way. I had to show the guards my hotel room key before they would let me through the gate and into the hotel. 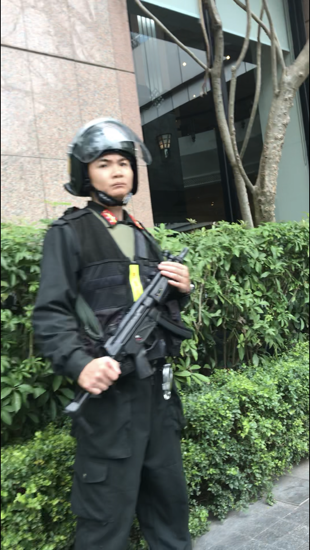 Walked past Lea very heavily armed guards, who looked at me with an expression that told me they would be very happy to shoot me, given half a chance. 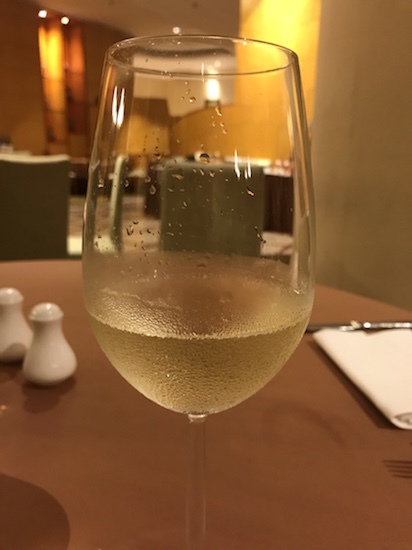 So after I had managed to get into the hotel, and was past my second glass of wine, well into my third, when the hotel employee asked me: “how was your day?,” it was hard to encapsulate my feelings into a very simple answer. How was my day, indeed? Good question. So I answered in what I thought was the most direct and honest way. “Strange,” I replied. My wife commented to me the other day that I was getting exactly what I wanted. I’ve always had a fascination with North Korea. That’s one of the reasons why I wanted my prior post: proximity to North Korea. To my surprise, I’m getting a lot more interaction with North Koreans here in Vietnam than I ever did in China. But now, I think I’m over it. I think I’ve had enough. Beam me up Scotty. This place is weird. What a strange way to mark my five-year anniversary of employment as a Foreign Service officer. The partial government shutdown affects the State Department. That means that embassies and consulates have to cease “non-essential” operations. Of course, as with everything else in the real world, what exactly gets shut down is complicated. What we did not do is to send everyone home, lock the doors, and shut down the consulate. The Department’s activity is affected by budgets, of course, but national security and the safety of American citizens abroad have to be prioritized. In addition, different activities of the State Department are funded differently, so some sections can remain operational. Some people still go to work, and maintain essential operations, like security of the consulate buildings themselves. Most of us have been sent home, with instructions to monitor the media for news that the government shutdown is over. I’m…on vacation? unemployed? neither? both? Regardless of whether we are put on furlough (like me) or we still go to work, none of us are getting paid. For my dear friends in the Consular section, its business as usual. Every day, hundreds of Vietnamese people arrive at the Consulate for their visa interviews. My consular colleagues still conduct the interview and issue the visa or refuse the applications. The local staff still perform all the administrative processes to print the visas and return applicants’ passports to them. Everyone is still employed, their work goes on as though nothing is different. What is different, though, is that none of them are getting paid. The only thing worse than working and not getting paid is… can’t work, and not getting paid. According to past practice, after the shutdown is over and the government has funding again, all of us will be paid for the work that we did during the shutdown. But there is no legal requirement for the government to give us back pay. What that means is that those “essential” personnel are required to work with no pay. I’d think, given our nation’s history, that we’d frown on making people work without paying them. Hyperbole aside, shutdowns are disruptive to government operations. We have important business with foreign governments that affect American citizens, involving trade, health, and security. These problems don’t go away when the government stops working on them. They don’t even slow down. After we go back to work, we won’t just pick up where we left off. We will have to recover a lot of lost ground and try to restart the momentum. My work doesn’t involve national security. I don’t have nuclear launch codes. I don’t even know any interesting national secrets. But because I’m furloughed, I couldn’t do my job, and that has directly affected some Americans. 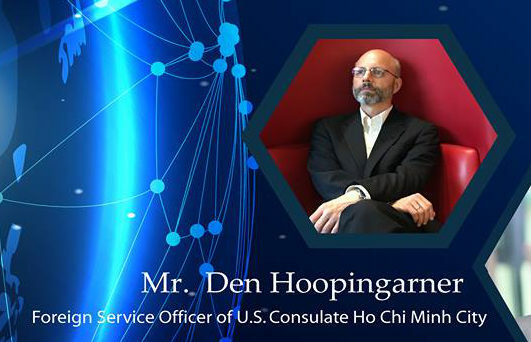 Last week, I had to cancel several meetings with American students who are in Vietnam for a study trip. I was going to give them a briefing on U.S.-Vietnam relations, to help them understand this country that they traveled 7,000 miles to visit. But due to the shutdown, I had to cancel. I couldn’t even meet with them unofficially in a neutral place. That would circumvent the rules. So, sorry, students, I really wanted to talk with you. I hope that you were still able to get the information you wanted. I’ve decided that the healthier attitude to have about this situation is to look at it as a staycation. Sure, there’s no paycheck coming in, so I can’t go away on a vacation, but I can still get some things done. I can still study Vietnamese (on my own – no budget to pay for language lessons). I can focus on learning iOS programming (Swift is a much easier language than Objective-C, but it’s still hard). I can work out and stay healthy (not to get ripped, but just to stave off decrepitude and hopefully live a few months longer with lower medical bills). And I can make treats to bring to my poor coworkers who have to work, often doing extra work, with no guarantee that they will ever get paid for it (Consular section, you’re getting coffee cake tomorrow). My sock drawer has never been more organized. We had a very interesting (but worrying) all-hands meeting last week. The management officer, who has to try to find money for practical things like paying the rent and electricity bill, delivered some sobering news. The shutdown means no money. 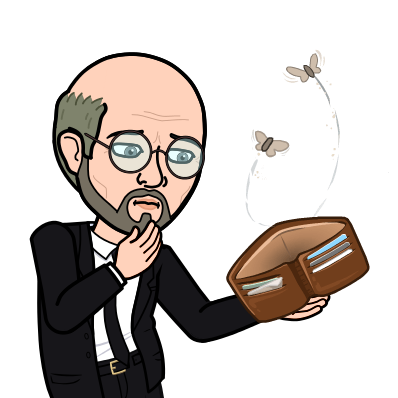 Things that we take for granted, like our housing, is currently paid up, but at some point, there will be no more leftover money. Eventually, posts will be looking for loose change under the sofa cushions just to keep the infrastructure of diplomacy running. This is now the longest shutdown in U.S. history. So we don’t have any experience to draw on from this point on, there are no more lessons learned from past shutdowns. We are now navigating uncharted waters. And no one knows how much longer it will last. The smart people are spending a lot of time and effort making long-term plans to deal with an unknown and unclear future. And aside from a few exceptions, no one is diplomatting. Unlike most times, I’m actually trying to look ridiculous here. It’s just a stupid thing that I do for fun. Ha ha. OK, that’s thing number one. On to thing number two. 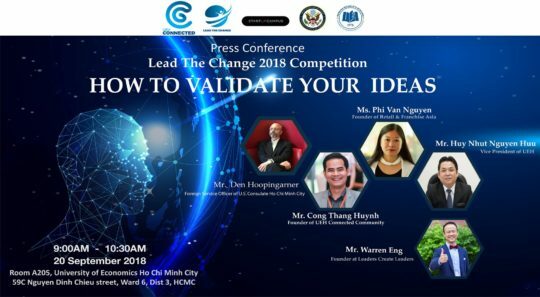 Today I got invited to join a press conference. A grant program that the Consulate supports had a kickof event. It’s a good program, training young people on entrepreneurship skills. I represented the U.S. Government at the event. I delivered brief remarks in Vietnamese, which impressed the participants. I’m pretty sure I looked and sounded ridiculous, but that’s not any different from any other day in my life. My famous coked-up look. Would you buy a car from this guy? Me, neither. Then the event turned into a talk show, where we discussed issues related to startups. As a diplomat, of course I am an expert in business, angel investors, and sales pitches. Not. My famous “thumb on chin” thoughtful pose. Man, am I ever learning lessons in self-awareness on this job. It was fun for me, probably painful for everyone else. But they got their revenge. And I paid a stiff price for being a smart-alack. The organizing group created a promotional poster to publicize the press conference. They needed a photo of me for their promotional poster. But they didn’t ask me for a photo, for some reason. Instead, they went online and searched for a photo of me. Are you starting to guess where this story is going? Can you spot the awesome-looking person in the picture? As always, my humiliation is your entertainment. My own Fulbright experience several years ago led me to my current job in the State Department. 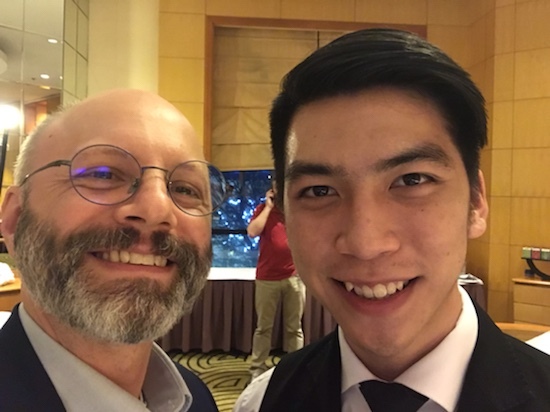 The Foreign Service officers who I worked with when I was a Fulbright scholar in Taiwan impressed me, and got me thinking that the Foreign Service could be a career for me, too. Now I’m in the Foreign Service, and involved in the Fulbright program from the other side. Every year we select a few bright graduate students from Vietnam to get a Master’s degree in the United States. I’m on the selection committee that interviews the finalists for the scholarship program. We reviewed the paper applications, and are now interviewing the final round of candidates. It’s been an inspiring experience so far. The people that we’ve talked to are bright, have done some amazing things already in their lives, and look to the United States as the place that can help them go to the next level. 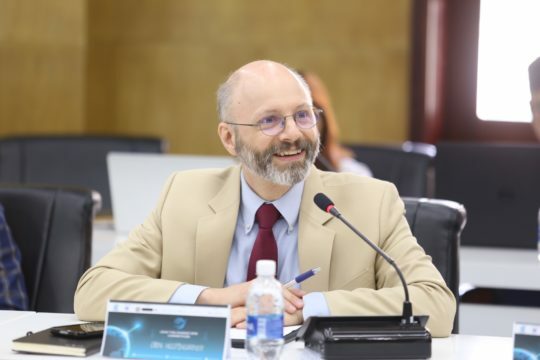 In my work in Vietnam, I have interacted with many people who have benefited from the Fulbright scholarship. 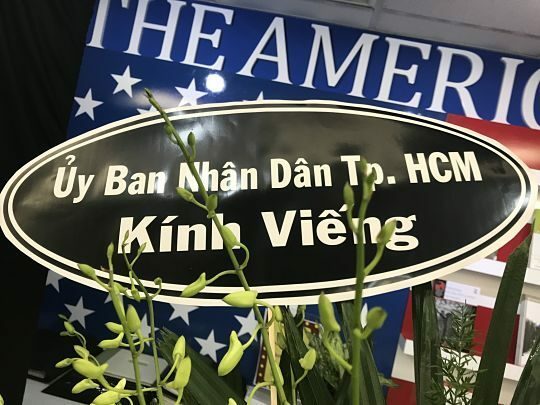 After they earned their graduate degrees in the United States, they returned to Vietnam, and are now helping to build their country. They brought back skills and knowledge in various fields, ranging from journalism to public policy. 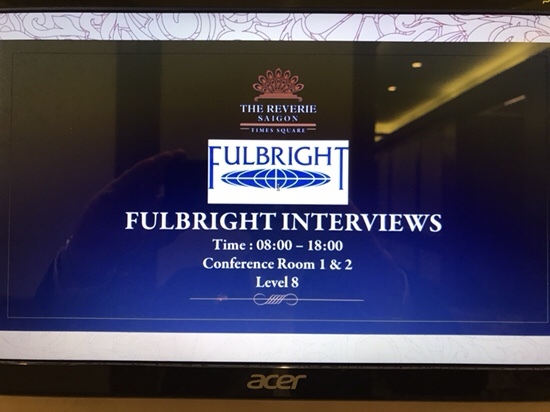 The Fulbright program is a tremendously effective foreign policy tool. 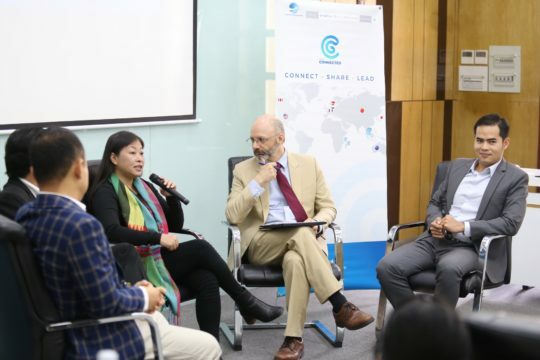 We are educating and training the future leaders of countries all over the world, sharing our values, and helping countries develop so that they can become contributing members of the international community. I am proud to be involved in the process that will select the next group of international students to the United States. I’m also inspired by their enthusiasm, energy, and dreams for their future. Even though I have 100 unread emails waiting for me back in the office every day after interviewing, I’m happy to put in the extra time to catch up with my regular work, knowing that I have been doing something so worthwhile. 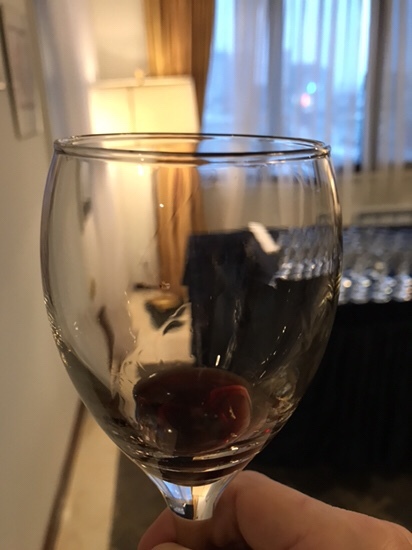 The other day, I was helping out at a reception that the Consulate was hosting, and I was asked to help out with some questionable wine. I work for the State Department, not a five-star restaurant. We do not have a wine cellar. We serve wine that has been donated to us from importers, and not all of it is very fresh. Apparently, some of our selections of wine that we have on-hand for receptions was getting a little old. Now, I’m no expert on wine, but I do know a thing or two about it. One of the things that I know about wine is that it comes in white and red (impressed yet?). One of the other things that I know is that if the cork crumbles into powder as you pull it out of the bottle, that’s a sign that the wine is past its prime. I drank this for my country. Why, yes, I volunteered. I fancy myself a bit of an expert on wine. For example, I offered, some of it is white, and some of it is red. You can imagine my great surprise that this bit of information was not the information that my coworker needed. I apparently was not being helpful. What they needed to know was how to tell if a bottle of wine had turned or not. That problem stumped me. The only way that we could think of was to taste-test it. Since I was the smarty pants who volunteered his expert help, I got the honor of tasting the wine for freshness. My coworker, being a smart person, found that action to be more helpful. And I, not willing to back down from my bold claim of being some sort of wine expert, found myself hoisted by my own petard. The next 15 minutes or so was spent with me tasting samples from several bottles of wine. My biggest takeaway from the experience was that it does not take a great expert in wine to tell if a bottle of wine has turned. You can pretty much tell with a tiny sip. Here’s the secret: if it tastes like wine, it’s probably OK. But if it tastes bad, not at all wine-like, but rather tastes something like a rotting log that someone picked up off the ground in a forest, then it’s not likely to be very good. And unlucky for me, more than one bottle in our selection for the evening fit into the latter category. To make my work even more unpleasant, none of the serving staff had taken sommelier training, and did not prepare a little silver bowl for me to spit out the wine after I had tasted it, so I had to swallow it. When wine turns, it doesn’t taste very good, but the alcohol content does not dissipate. So yesh, I got drunk on bad wine. It felt like college all over again. Once again, I made an idiot of myself. Just in time for the guests to arrive. That was one more victory in my stellar diplomatic career. So there’s a protocol for this, too, I learned this week. 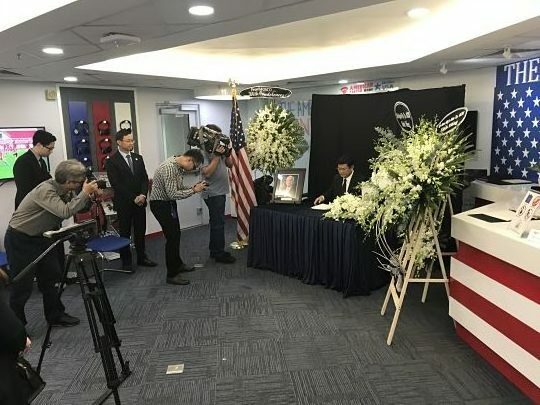 We set up a table in the American Center, where members of the public can sign the book of condolence. 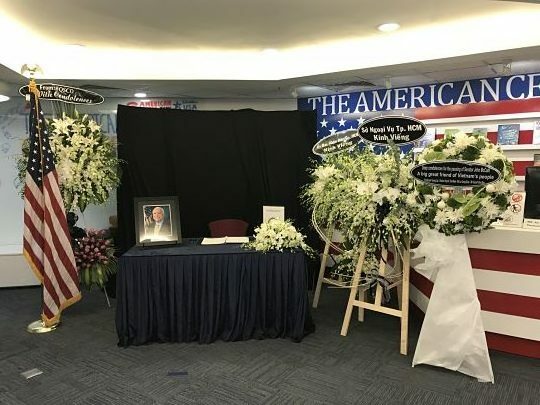 As we received the news of John McCain’s death, we began preparing for condolences. 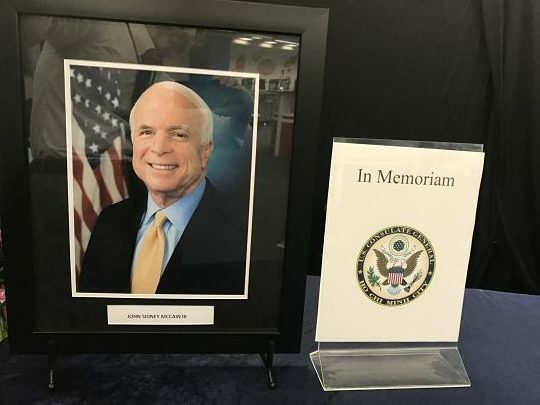 It’s human nature for people to want to pay their respects, and we were not surprised that so many Vietnamese people were saddened by Senator McCain’s death. He is remembered here in Vietnam as a soldier turned statesman, who worked hard to normalize relations with the United States. They are especially impressed by the fact that he was treated so harshly as a POW here, and yet put aside his personal pain in the interest of a greater good. He was the embodiment of their country’s resolve to overcome the painful past and work toward a better future. There is a specific State Department protocol for a book of condolences. We set up a signing station in our American Center, and publicized times for the public to come in and sign. Local government officials also came in to sign, and that was covered by the local press. The pages of the condolence book will be sent to Washington, D.C. and added to the international collection from our embassies and consulates around the world. Flowers have been coming in all week. Flowers are from private citizens as well as the government. Regardless of whether one agrees with his political party’s policies and agenda, his reputation as a man who put country first is universally admirable. The Vietnamese people held him in great regard. All the press coverage here, and social media, wrote moving eulogies. Even the social media trolls on our Facebook page were silent. 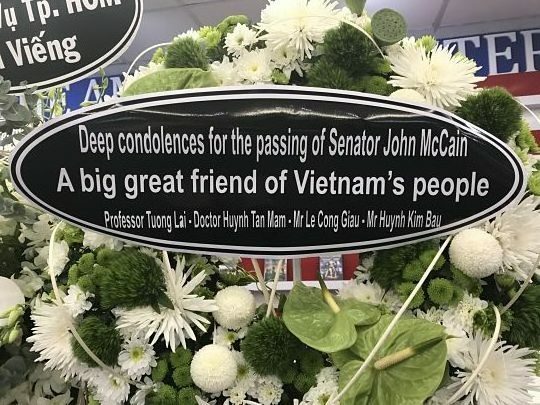 It seems that Vietnam is unified in its respect for John McCain.